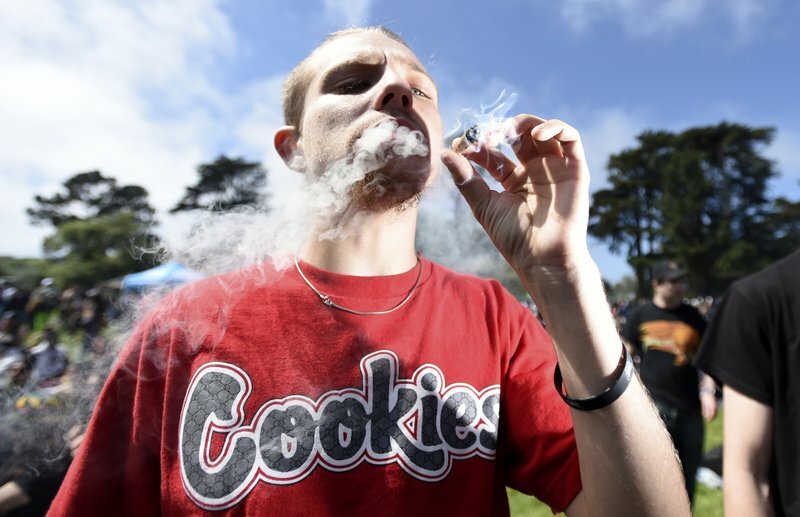 Thousands of marijuana enthusiasts simultaneously exhaled a giant cloud of smoke that rose above San Francisco’s Golden Gate Park precisely at 4:20 p.m. Friday, the annual April 20 high holiday. An estimated 20,000 people flocked to the park’s so-called Hippie Hill for the annual 420 celebration of all things pot and the number that is stoners’ code for smoking marijuana. Events also were held in other cities worldwide. The San Francisco gathering was the first since California legalized marijuana on Jan. 1 and it may have been its biggest yet. A small, informal gathering that began several years ago has blossomed into a full-blown festival of corporate sponsors and commercial booths selling smoking devices, T-shirts and food. Plenty of marijuana products also were on sale, with sellers fanning through the crowd like hot dog vendors at baseball games. San Francisco TV station KGO reported that 12 people were transported to hospitals for treatment. KGO reported the San Francisco Police are investigating some of the cases as possible fentanyl overdoses. Five Northern California men say they created the 420 code in 1971 while high school classmates when they planned to meet at 4:20 p.m. to smoke.